This week on The Elite Advisor Blueprint, I get the chance to talk with Jon Vroman. Jon is an award-winning motivational speaker, author, philanthropist, podcaster, personal coach, ultra-marathon runner, founder of the Front Row Foundation and most importantly, husband and father. I got to know Jon personally at a dad’s retreat last year that he ran with his good friend Jon Berghoff who was recently featured in episode 16 of the podcast. Jon has one of the biggest hearts of anyone I’ve ever met and has a truly inspiring story. After an incredible start to his career in the sales industry where he climbed the corporate ladder very quickly, he made the decision to literally step into his boss’s office and quit so he could start a charity. 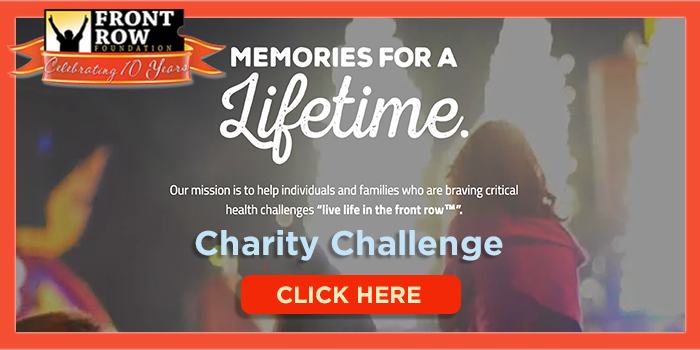 This led to him co-founding the Front Row Foundation which helps create “Front Row” type experiences for those suffering from life threatening illnesses. This has included past recipients literally sitting front and center and often meeting their favorite athletes or entertainers. Performers like Justin Bieber, Jason Aldean, Garth Brooks, Jimmy Buffett, Carrie Underwood, Bon Jovi, & Alan Jackson. Along with professional athletes like Steve Nash, Johnny Damon, and Derek Jeter. Jon shared some incredibly powerful stories during our conversation on how they’ve been able to impact others that are battling for their life, but also how these experiences have impacted his life in return. Be ready for some emotional moments as Jon had me on the verge of tears multiple times with the stories he shared. For many of you Blueprint listeners who have helped us raise over $25,000 during our past March Madness Charity events, I’m proud to announce that we are partnering with Jon and The Front Row Foundation this year. So, if you are moved by this conversation, we’ve made it easy to help create a “Front Row” experience that will help someone battling a life threatening illness. In fact we are still accepting nominations if you unfortunately happen to have a friend or family member in this situation, send me a personal email brad@bradleyjohnson.com if you’d like to find out how to make the nomination. Also, we have created a special page for this years event, go to bradleyjohnson.com/charitychallenge if you’d like to help us make a difference for someone in need. You guys are going to love the ideas Jon shares here! Also, in typical Jon Vroman fashion, he did something special for all you Blueprint listeners and setup a page for special pre-release pricing on his new book The Front Row Factor: Transform Your Life with The Art of Moment Making due out March 28th. In his new book, Jon distills all the life lessons he’s learned from sharing moments with those who are fighting to stay alive. All pre-release purchasers also get some special bonus offers as well, so be sure to grab your copy here. [05:23] Jon shares the story of how he transformed his life and the way he now views the world. [08:50] Jon’s talks about his early career working for CutCo and why he decided to take a leap of faith to quit his job and become a full-time speaker. [13:15] A few inspiring stories from Jon’s book Front Row Factor: The Art of Moment Making and what they can teach us about making the most of the time we have. [20:20] How having hope for the future can change how people invest in the present. [23:00] How the fear of knowing this ride could end at any moment, motivated Jon to live big, give big and create a world that would make his kids proud. [27:55] Being reminded that one day your life will come to an end and using that to focus on what matters the most right now. [32:44] Jon’s top tips to financial advisors for captivating your audience, crafting a compelling story and mastering your next public speaking gig. [37:28] How to use the power of story to connect with people so you can land more appointments. [45:52] Why a proper introduction is critical before taking the stage. [50:00] Find out how Jon deals with an audience that isn’t fully engaged and who he decides to focus his attention on. [54:38] Jon shares the life lessons and nuggets of wisdom that he’s received from interviewing leading experts and entrepreneurs on the Front Row Factor podcast. [58:00] The importance of helping others achieve their goals and how it will come back to you twofold. [59:31] Why Jon thinks of his Dad when he hears the word “successful”. [01:00:56] Discover Jon’s favorite book and how it’s changed his life! [01:03:56] The advice Jon would give to his 30-year-old self. [01:06:00] Jon’s gives the one piece of advice that has led to his success. Jon Vroman’s Speaker Intro – Make sure you get the intro you deserve! [0:00:37] Brad: In this episode, I get the chance to talk with Jon Vroman. He’s a philanthropist, speaker, author, podcaster, ultra marathon runner, and in his words most importantly, husband and father. I got the chance to know Jon personally at a Dad’s retreat last year that he ran with his good friend, Jon Berghoff who we had on our last show. And Jon has one of the biggest hearts of anyone I’ve ever met and has a truly inspiring story. After an incredible start to his career in the sales industry where he climbed the corporate ladder very quickly one day back in 2005, he made the decision to literally step into his boss’s office and quit so he could start a charity. This led to him co-founding the Front Row Foundation which helps create front row type experiences for those suffering from life threatening illnesses. This has included past recipients literally sitting front and center and often meeting their favorite athletes or entertainers. Performers like Justin Bieber, Jason Aldean, Garth Brooks, Jimmy Buffett, Carrie Underwood, Bon Jovi and Alan Jackson. Along with professional athletes like Steve Nash, Johnny Damon and Derek Jeter. Jon shared some incredibly powerful stories during our conversation on how they’ve been able to impact others that are battling for their life, but also how these experiences have impacted his life in return. Be ready for some emotional moments as Jon had me literally on the verge of tears multiple times with the stories he shared in this conversation. For many of you Blueprint listeners who have helped us raised over $25,000 during our past March Madness charity events, I’m proud to announce that we’re partnering with Jon and the Front Row Foundation this year. So if you’re moved by this conversation, we’ve made it easy to help create a front row type experience that will help someone battling a life threatening illness. In fact, we’re still accepting nominations if you unfortunately happen to have a friend or family member in this situation. Go ahead and send me a personal e-mail, brad [at] bradleyjohnson.com and I’ll be happy to share with you how you can nominate them to potential benefit from what we’re doing through the March Madness Charity. Also, for those of you that just want to give towards this cause, we’ve created a special page for this year’s event. Go to www.bradleyjohnson.com/charitychallenge if you like to help us make a difference for someone in need. So besides running a charity that’s raised over one million for those in need, Jon also happens to be a world-class professional speaker and has been named “College Speaker of the Year” multiple times. In this conversation, we also dive into some incredible tips on how to, one, be properly introduced as you take the stage, two, captivate your audience, and more importantly, how to drive engagement if they aren’t captivated, and three, craft a compelling story and utilize that story to drive appointments. You guys are going to love the ideas Jon shares here. Lastly, in typical Jon Vroman fashion, he did something special for all you Blueprint listeners and set up a page for special pre-release pricing on his new book, “The Front Row Factor: How to Transform Your Life With the Art of Moment Making”. It’s due out March 28. And in this new book, Jon distills all the life lessons he’s learned from sharing moments with those who are fighting to stay alive. All pre-release purchasers also get some special bonuses as well. You can check those out at www.Front Rowfactor.com/brad. And go out and grab your copy there and get all the bonuses that come along with it. As always, you can find everything, including links to books mentioned, people discussed, everything else in our show notes at www.bradleyjohnson.com/17. Thanks for listening. Without further delay, my conversation with Jon Vroman. [0:04:19] Brad: Welcome, everyone, to this episode of The Elite Advisor Blueprint podcast. I have my good friend Jon Vroman here with us today. Welcome, Jon. [0:04:29] Jon: what’s up, Brad? Thanks for having me, buddy. [0:04:30] Brad: Happy to have you, man. So I was playing around. We were chatting here before we went live. And I’m not even sure how to introduce you, man. You’ve got so much cool stuff you’ve got going on. And tell your wife to come back in. [0:04:30] Jon: Awesome. Thanks, buddy. [0:04:46] Brad: So just for you listening in the audio here, Jon’s wife was delivering tea. His getting over a little bit of a cold here, so always great to have people in your corner. Right, Jon? [0:04:46] Jon: For sure, man. Absolutely. [0:04:46] Brad: So, as we were chatting here as far as how to introduce you, I mean, you do so much cool stuff and we have the chance to meet at the Dad’s retreat that you hosted in Philly with Jon Berghoff. And my buddy, John Ruhlin, kind of introduced me to the whole retreat. That was amazing. Then, I find out you run your own charity that you started back in 2005, the Front Row Foundation. Then I found out, oh, by the way, this guy is College Speaker of the Year, two years in a row. And it just goes on and on. So rather than have me butcher it, can you share a little bit of your story with the listeners that might not know who Jon Vroman is and just kind of, maybe even back up before the whole charity thing, how you met the whole crew at Cutco and where that’s led you to today? [0:05:41] Jon: Yeah. Oh, this would be a good personal challenge. I’m looking at the clock now to see how fast I can do this and have it make sense. Yeah. So, well, the whole journey began in an awesome family, military dad. He was a captain in the Navy. We moved around a bunch in life. And I think that may have been the place where I really found a passion for connecting with and meeting new people, which still is a big part of my world today. And everything was normal up until I would say where I got to high school where I was really uber short. Like I’m talking tenth grade, 4’10, 85 lbs. And I had the bone age of a nine-year-old when I was 16. That caused something to happen that would later serve me in life, which was that I felt very insignificant. I felt shy. I felt like I was not playing the game of life. I was terrified of people, I had a lot of fear. And so, I lived that way for a number of years until I had some experiences in my life that would transform and change that. And that’s sort of the journey of what led me to the start of the Front Row Foundation. I talk about this whole thing where I give the example – and we can get into this later. But I talk about the perfect storm in my life where I had these three incredible experiences which would change the way I’d view the world, ultimately leading to what happened in 2005 which was the birth of Front Row Foundation. And for all your listeners, Front Row Foundation is a wish granting organization, much like Make a Wish, where we help kids and adults who have a life threatening illness to get a front row experience at the event of their dreams. And that was in 2005 that that all began. And that moment where we began the charity was truly a transformation in my world because since that moment when we began it, everything in my life has become about being in the Front Row. And that’s the metaphor that we teach about being close to the things and the people, or whatever it is that inspires us in life, what makes us come alive, as we say. And so since then, since starting the charity, I kept asking myself the question, how can I let my professional life serve the charity at an even greater level? And what was a beautiful and natural fit was keynote speaking. And so, in 2008, I became a professional keynote speaker, full-time, where I would travel the world and share the Front Row message. And essentially, what that means is everything we’ve learned about living life from people fighting for it. And the tremendous mindset that they bring to each and every day, especially dealing with some very challenging circumstances, and I feel like everybody listening, whether you’re fighting a life threatening illness or not, we understand challenging situations in life. And so, we can learn a lot from people who are facing some really difficult times in how they overcome and move through and find higher purpose and deeper meaning in all of what they do. And, ultimately, that leads us to this moment where we’re talking today, because my entire life is now built around helping people live life in the Front Row. I do that professionally and I do that through the charity. And it’s all integrated into one giant message. That was three minutes, buddy. How did I do? [0:08:47] Brad: That was impressive. It’s like you speak for a living or something. [0:08:51] Brad: So take me back. Because what’s interesting, obviously, this is a podcast for financial advisors, many of them have helped people give to charitable causes. Many of them have their own foundations they’ve set up. So back in 2005, and tell me if I’m butchering any of this, I actually had a chance to grab dinner with John Kane who I also know is a Cutco guy that’s inspired you and help you get where you are today. If I remember right, you kind of had a pretty direct conversation with John. You had had a lot of success inside Cutco and I believe you’re leading a team at that point. But it was kind of like, “Hey, I think I’m called to go this route into charity.” So was there something that was a turning point there that caused that specifically or was it just one day you’re like, “I just want to go do awesome things for awesome people.”? [0:09:34] Jon: Yeah. So to give that even some context about Cutco, so throughout my 20s, and this was a hugely influential company for me. If anybody’s listening, it’s a high-end kitchen cutlery company. They do direct sales. And I started selling Cutco at age 19. We’re talking like a thousand dollar set of knives. You sit down across from usually a couple in their home and present this product. And then you’d ask for referrals and go sell another set of knives. And at 19, that’s amazing sales training, learning how to manage your calendar and to work with people and build rapport and show value, and then ask for the sale. And so this was my life for a number of years. And you’re right. I ended up landing in what I consider to be the dream job. I was executive at Cutco. I was making great money. I was traveling the world. My job was to create contests and then take the winners on big trips. I mean I took 400 people to Italy for a week. I took people to Argentina. I traveled to a dozen countries around the world at the nicest resorts with hundreds of people. And I had a corporate credit card and was living the dream. And for people on the outside looking in, they’re like, “Why would you ever want to leave that?” But what happened was it wasn’t that I didn’t love the company or the people that I worked with, it was that ultimately, when I looked at what an ideal life looked like for me, I was not able to create that within the position that I was in. And that meant ultimately serving Front Row Foundation at the highest level. And so, yeah, I had a conversation with my buddy, John. He was like, “As much as I want you to stick around, you need to go. And you need to go do this thing.” And so, in 2008, I took a leap of faith. I was like, this is not the success story that most entrepreneurs want to hear. But I left my work literally almost like I left on great terms with the company. But I went out without really any backup plan. It was just like, “I’m going to go speak and coach for a living.” The first year, I paid $100,000 to call myself a speaker and a coach. Then next year, I went $100,000 in debt calling myself a speaker and a coach. And the third year, it took off. And I was back. I was making six figures and working on paying off that debt. And then, it was never turning back from there. But there was a big leap of faith there in 2008 to go pursue all of this full time. [0:11:52] Jon: That’s what you call burning the boats behind. So I’m incredibly excited, buddy. And I know we’re just still starting to work through all of this. But I just can’t wait to let our clients, our advisors, see the impact of what you’ve been doing since 2005. So with your book coming up, I want to work that into the conversation because you’re taking these experiences that you’ve experienced firsthand since 2005. And some, just, I’m sure tear-jerking stories. And your packaging this into a book. Can you share a story or two of what that charity has done for you since you started in 2005? [0:13:38] Jon: Yeah. Well, what started out as wanting to give to people who were in need, I feel like in some ways, I’ve been the biggest beneficiary because being witness to their incredible lives, I’ve learned so much about what it means to live life to the fullest, or to live life in the front row. And I go all the way back to the very beginning, Brad. This was all about making a great day for somebody who really needs it and deserves it. But what’s happened since then, it was so much more. We didn’t see it coming. I would love to claim that it’s a brilliant vision from the get-go that I saw this whole thing laid out perfectly. But a lot of our discoveries came by trying these things and watching what was working. And what we learned about this whole experience was that the power of hope brings the future into the present moment. So it’s not wishful thinking that we sort of hope we wish things would be different. Hope brings the power of what’s possible into the present moment so that we can take action today. We notice that people were acting and behaving differently when they had something to look forward to. We also noticed that after the event, there was a tremendous amount of celebration that would occur that we didn’t anticipate either. And I didn’t see this coming. But I remember one of our, a mother of a four-year-old girl, who we created an event for, she had said to me that one of her greatest fears was people would forget about her daughter because her daughter sadly had passed away. And she told us that one of her greatest fears was people would forget her. And so, holding the memory alive was so important to individuals. And one of out every two of our recipients passes away after their front row experience. And this day becomes so important to their families. So we didn’t anticipate the celebration not only for the individuals but their families for a decade and beyond to come. That was very powerful. I remember hearing from one of our event coordinator, his name is Carey, they went to see a recipient named Mike in the hospital shortly after his even. And Mike was sadly in the final days of his life. But he was sitting in his hospital bed flipping through his photo book, looking at his day and smiling ear to ear reminiscing. And we realized that we could bring the power of the past into the present moment. And we could bring that energy we once felt into the moment now to experience life differently. And that, ultimately, at the end of the day, it was all about living life differently in the present moment. It was all about now because no matter how many days we have, it’s making the most of each one. And that’s sort of cliche to say but it’s so important for people to recognize that there’s nothing you’re going to do today to earn or deserve tomorrow. In other words, yes, you can work out and eat healthy. But as much as you might do that, when your time is up, your time is up. And there’s not a single thing that any one of us listening on the podcast or you and I will be doing today that somebody else wasn’t doing when it was their last day. You could wear your seat belt. But if the time is up, the time is up. And so, knowing how important and critical each moment is has really transformed me. And I’ll give you one last quick story. It’s dangerous when you give a public speaker the mic, isn’t it, Brad? [0:17:12] Brad:You keep talking and I’m about to cry. So I’m just warning you right now. [0:17:15] Jon: I want to give you one other quick story because this is one of the most important, I think, and recent stories. So about a month ago, I was privileged to take a woman named Nikki and her husband, John, to a Dallas Cowboys game. And I was so happy to be her event host, we call it, the person who takes the pictures and the video. And make sure that everything is taken care of so the person can just focus on having a great time, and documenting the event, which is one of the most critical things. We give every recipient a full color photo book and video. She said, “It makes me happy because in order for somebody to look at me with disgust means that they have no context to what I’m going through meaning they’ve never gone through it themselves and they certainly have never had a family member or friend go through it. Because had they, they wouldn’t be looking at me that way. So I’m happy that they have no frame of reference for what I’m dealing with.” And I was just totally blown away about the mindset that she brought to that situation, the way she was able to see the world. And that’s what see time and time again, in different ways from different individuals. But this book, Brad, is a collection of the most amazing stories that we’ve witnessed from nearly a hundred of these front row experiences. It’s the science that we included to back it up so it’s not just like, “Oh, that’s a neat idea.” Hope sounds really light and fluffy. But we bring science to talk about how that’s so powerful. And we give some strategies about how we can all be moment makers in life. So we want to be moment makers for these recipients. But we want to teach everybody how to be moment makers in their lives. We want you Brad, and everybody that you’re a part of to make the most of the time you have because I think that’s what it’s all about. It’s about maximizing each and every moment that we’re given and making it the most successful for you and others however you define that. And this book packages exactly how people can do that. And that’s what it’s all about. And how do we take this money that is essentially just a fuel for experiences, right? And how do we apply that to the rest of our lives? So as different as these two scenarios are, it’s interesting how still a lot of similarities can be applied. [0:20:18] Jon: Oh, I think, by the way, I want to comment about that too, Brad. I think that’s so powerful, especially for financial advisors. I have a friend who’s a very successful financial advisor, you included in that category of very successful financial advisor friends. And I said to them, one time I said, “I remember reading this incredible research study about how people that visualize their future in great detail and having hope for what their future would look like and seeing that in great detail would change how they invested their money today.” So it’s literally, this was the point of the research study was to see how having hope for the future or envisioning the future would change how much money they would invest today. So developing a relationship with our future self, being able to use that future power into the present moment, changes the way they invest or spend their money now. I thought that was so fascinating because we did a lot of research into future thinking. And that’s what we realized was how much it changes our behavior today. [0:21:21] Brad: You’re speaking inside of the book. You pulled a lot of this from research. [0:21:24] Jon: That’s right. Yeah. [0:21:25] Brad: I know why you’re saying this. [0:21:26] Jon: Yeah. And I think that’s just a great example of how that type of thinking relates to somebody like a financial advisor. Like I would want to understand that future thinking and how that impacts the client in front of me. [0:21:37] Brad: Yeah. It’s interesting because, in financial services, name any product out there that’s ever existed. And some people love it, some people hate it. And here’s the reasons for each side of the equation. The things that nobody ever hates are the benefits, right? So if you could speak to, here’s a product that allows me a paycheck for the rest of my life. So I don’t have to stress every time the market corrects, right? I want that. But then, when you slap a label of annuity on it, “Oh, I don’t want an annuity. Never mind”, right? So it all goes to the benefits of why people want the things they want, whether it’s in life or in financial services or wherever they’re at. So you just intrigued me so much, man. I’ve never connected with somebody so quickly where you just get this genuineness that just oozes out of you. And even going to a lot of people talk about things. You know, a lot of people say, “I want to be more charitable. I should give more money to charity.” You thought that and you went and created your own charity. You quit your job and created your own charity. The Dad’s Retreat, a lot of people say, “I want to be a better dad.” And you’re like, “I want to be a better dad.” And you look around and you don’t see what you’re looking for. So you start the dad’s retreat. And you fly 40 guys into Philly. And you find people that have awesome frameworks to share to be a better parent, right? So what is it in you that? You’re a doer. You’re not just a sayer, you’re a doer. What created that? What instilled that in you? [0:22:59] Jon: I think a fear of getting to the end of my life and wishing I would have. You know, Marianne Williamson has a great poem which said, “When we let our own light shine, we unconsciously give others permission to do the same.” She talks about your playing small does not serve the world type of thing. And it’s this idea of wanting to express yourself in a way that honors the gift that you’ve been given with this life. So honestly, it’s fear. I remember sitting down one time and thinking, “All right. If I were just to draw on a piece of paper and I have this in my journal, I could literally show a picture of it.” I drew a dot on the left that said, “Birth”, I drew a line two-three inches across the page. I put a circle. I wrote “death”. And I said, “All right. Let’s just guess that I live to be a hundred.” I mean, we could be optimistic and say it’s 120 or whatever. But let’s just guess it’s a hundred. And I said, “Out of those hundred years, how many great years do I have?” Like, I mean, full, physical abilities. What would be just reasonably guessing, I don’t know, 80-85? Let’s say? If I really take care of myself, I could be a super active up until that point. So maybe 85-ish, whatever. I drew a line and I was like, “Where am I now?” And I was about 40 when I did this and I just put that little dot there. And then I looked at it and I saw my whole life on this timeline. And I thought, “Man, that’s so important that I do stuff now.” Not to the point to where it’s like I neglect what’s important. It’s to the point to where I focus on what’s important, to the point to where I wouldn’t say every minute matters. And lots of people have done this exercise in unique and different ways. I remember hearing about one guy who had a bowl of marbles, two bowls, in fact. And what he said was he said, “All right. Listen. If I lived to be a hundred, and I have this many Saturdays in my life, I’m going to put a bowl of marbles over here that represent the number of Saturdays.” And then he started by moving the number that have gone past into the other bowl. And every morning on a Saturday, he wakes up and he moves a marble from one bowl to the next. And he just sees his life being either wasted or utilized. And you’ve heard people say this that I think Tony has said this many, many times is that your life is either a warning or an example in many ways. And I wanted to make sure that the greatest gift that I could give to my kids or to my friends to show up a certain way, that if I want people to feel valuable, if I want to feel worthy, if I think that the answer to the greatest problems in life is that everybody shows up with their thing and does it with excellence, then I have to be an example of what that looks like. You start by thinking about what does ideal look like? What would a life fully lived? What is a life in the front row look like for me? And then, what do I need to do in order to achieve that. But more importantly, Brad, is who do I need to be in order to do that because if I’m being a certain way, I’m doing certain things naturally. If I show up being powerful and courageous, my actions tend to follow suit. And then, also to celebrate it along the way because it can’t always just be about action and more, and stacking more on it. It has to be about honoring what’s been done. So it’s a little bit like, yeah, let’s get to where we’re going. But let’s stop and smell the roses along the way. Both need to happen simultaneously. Yes, I need to drive forward to the next city. But, yes, I need to love the one that I’m in and appreciate where I am. I think a lot of people go through life wishing they’re at a different party, thinking that if they were at a different party, it would be a lot more fun versus saying, “How do I make the party I’m at great?” And, yes, let’s design where we go to the next party but it’s both. And so, I think what makes me come alive is the fear of knowing that this ride could end any moment, and the desire to want to contribute to the world in a way that my kids look at my life that they’re proud of the one that I led. And that they’ll use that as a great example. [0:26:33] Brad: You made me think of Cameron Herold was on the show a few shows back. And he said he changed his perspective. He said, “I don’t think about wasting my time anymore. I think about I’m wasting my life.” And what you just said is spot on with that. I think a lot of us sign up for things that we’re maybe not all in on. And when you really change the frame or the lens that you look through and you’re wasting your life, not just your time. It will make you choose a lot more wisely. I’ve gotta ask you just based on your book coming out and the Front Row Foundation, have you read a book called “When Breath Becomes Air”? [0:27:06] Jon: Yeah. For those listening, I’m holding it in my hands right now. [0:27:12] Brad: You didn’t plan this either, by the way? [0:27:13] Jon: No. I’m holding it. So this is on my reading list. [0:27:17] Brad: Just speaking of, you never know when. I think the neurosurgeon, that’s his memoir, that wrote that. I think he was 36 when he found out that he had terminal cancer. And I’m 36, so that kind of really hit home to me. And I was literally on a flight out to San Diego with tears just coming down. And I was listening at audible. I had to stop at multiple times because I thought the lady next to me was going to like, she thought I was having a nervous breakdown or something. It’s a powerful, powerful book. So when you get the chance, that’s going to validate a lot of stuff that you do in your life for sure. And I think one of the greatest challenges in life is that people don’t think that their moments matter because they think they’re always going to have another one. And that’s because they’re really conditioned to know that the likelihood you’ll wake up tomorrow and get another chance is there. And that’s good. We need that, right? We need to know that we could try again tomorrow and start over again tomorrow. The problem is when we go into that mode too much to think, “Well, these moments don’t count because I just get another one later.” And we waste it. And that waste drives me crazy. I just don’t want to waste it. And I think that doing some type of exercise for everybody today. Just do what I did. Take a piece of paper out and just write that little timeline and see it. It’s very different when you visualize it. Or ask yourself, “How many days, if you lived to be a hundred, do you have left?” Because if you’re listening to this and you’re 50, if you say to be a hundred and you’re halfway through. It’s halftime. What are you going to do? Bring it up all the way back to the game analogy where we started this? It’s like how are you going to play the game for the rest of the time that you have because one day the game will be over. And I think that’s really important for everybody to be reminded of. And as a financial advisor, I think what’s powerful about that is that’s a way to bring purpose into what you do because providing financial stability long-term, legacy type financial stability for your families and for the things that matter most, whether you’re putting money into certain funds that support initiatives or people, or whatever it might be. The idea of investing, whether it’s money or energy or time or whatever, into what matters can be very purpose driven, if we allow that to be the intention. And when we bring nothing matters much until we bring a meaning to it. And it’s up to us to define that meaning as financial advisors or moment makers in other industries or creators, we define that moment. We tell that story. We have to become expert storytellers and question askers to be interested in people’s stories and their values and what they want that legacy to be. That’s what we do. I understand people’s values by knowing what event they want to see and then making that dream come true and then showing them how they can use that every day in their lives to make it work. [0:30:29] Brad: Well, super honored to number one, that you guys would partner with us for our March Madness experience. It’s going to be incredible. [0:30:35] Jon: So much fun. [0:30:36] Brad: And thank you. I want to say you guys bent your rules, but you definitely opened it up to where, hopefully, this can directly impact someone that’s close to their life. So thank you for doing that for us. [0:30:47] Jon: And I should mention right there, Brad, that they can nominate somebody through the website, www.FrontRowFoundation.org. If you happen to know somebody right now that has a life threatening illness, you could nominate somebody. And even if you wanted to mention where you heard about that from or perhaps you’re part of Brad’s team or you heard about it on the podcast, whatever it might be, feel free to mention that in the nomination. [0:31:07] Brad: Thank you. All right. So I want to switch gears a little bit on you. [0:31:10] Jon: All right. Let’s do it. [0:31:11] Brad: So not only do you do all this charity stuff and write books in all your spare time. But you also are an incredibly good speaker. I’ve witnessed it first hand. And I know you were College Speaker of the Year, named a couple of times. You run Speaker Trainer Experience. And so, for many of the listeners to this podcast, many of my clients, a lot of financial advisors do a lot of public speaking, whether it’s at dinner seminars, whether it’s at client events, whether it’s at charitable events. And so, I just want to pick your brain a little bit. And maybe if you’ve gotta a framework or two. I guess I’ll set the stage a little bit and then I’ll just let you run. So knowing what we’ve talked about to this point, a lot of our advisors are standing at the front of a room, with a bunch of strangers that typically have never seen them before. Maybe they heard their radio show. Maybe they got their mail or invites to the event. But other than that, don’t know much about them. And really, their challenges at the end of that hour with them, that audience member needs to like and trust them enough to be able to sit down, set an appointment, sit down, have a conversation with them on a topic a lot of times they haven’t even talked to their children about it. I mean, family finance is a lot of times, that’s kind of a taboo subject. So I guess I’ve kind of set the stage. You can go wherever you want with this. But thoughts on engaging with the crowd, getting to the end goal of setting an appointment. What are your thoughts there? [0:32:37] Jon: Yeah, good question. And what I’ll do is let me offer up a couple of ideas that anybody listening today can take and implement on a speech that you’re going to give tonight that would make a difference. And I will tell you that they don’t have to be new ideas to be effective ideas. So whether or not you think you’ve heard this before, I would challenge you that if you have, to not say that’s old news, but ask yourself how can I dig deeper with that to achieve mastery. Like maybe you’re being reminded of this for a reason. And here’s what we teach at our event and here’s what I would challenge people to do. Number one is that if you want to deliver an amazing message, you need to enter the world of your audience. And you need to do that in a deep, deep way. You need to ask yourself dozens of questions about your audience to fully understand who’s in front of you. To the point that you’d say, “What is it that are their greatest fears in life? What are their greatest desires in life? What have they experienced in life in the months, weeks, and even hours leading up to this event? How are they feeling when they’re in front of me?” And that may be the difference of whether you’re giving the speech in the morning or the evening. If you don’t fully understand how they’re showing up to that room in front of you, you won’t be able to deliver a message that truly captivates and moves them in a way that you could if you knew that information and if you really internalize that. So often times, when I start the speech and what we teach people to do at our event through a really in-depth process is to fully enter the world of the person sitting in front of them. Now, that might mean if you’re delivering a speech that somebody else is organizing, you almost need to enter the world though the event organizer. So if, Brad, somebody paid you to come in to speak to their group, I’d want to talk with the event organizer to say, “What are your top three outcomes for this speech? If this is a home run, what will I have done? How does that audience think, feel, what do they want to do, if I’d hit a homerun for you? Also, I want to know if they’ve had other speakers before and they didn’t deliver, what was missing? Why didn’t they like that speaker?” I want both, you know, what I could do and what I shouldn’t do in order to connect to that guidance. So I can get clues from other people who know that audience well. If I have direct access to the audience, I can go survey the audience. Now, you could literally survey the audience with like a Google form survey, but you can also just call a couple of key people. Sometimes, I’ll call the most influential people in the room, the most opinionated people, the ones I care about their opinion, or that are highly influential with the rest of the group, or that know the group the best and ask them questions that I’m just talking about. So I think that a lot of the work that’s done to deliver an amazing presentation is done beforehand before they even hit the stage. And I think a lot of speakers underestimate that. They think it’s all about wooing the crowd. And, yes, if you’re an amazing storyteller and you have a captivating story like, “I was killed and brought back to life and then I was a prisoner of war,” then you’ll probably captivate most people with an amazing story, if you will. But if you want to really connect with an audience without that per se, then you need to know who they are, what they fear, what they want. Now, when you get into the presentation, and we walk through in our event where we teach people how to do this, we walk through a whole framework that teaches somebody how to create a speech. And there’s also difference with speech, of facilitation, of training, those are all different things, right? And we show the nuances of that. But if you are just giving a speech, what I always say is that some time early on, you need to address the problem and address the promise early on. Now, you have really about 90 seconds tops to captivate your audience. I remember talking with a professional comedian one time. He said his entire whole routine was memorized. The whole skit is exactly the same word for word, right? But he changed the opening, the first 90 seconds. And what comedians always say, “I killed it”, right? When he killed his first 90 seconds, the whole rest of the speech went great. But you have this one switch where the first 90 seconds just wasn’t as funny, and the rest of his routine, his act, right? The rest of it bombed because he lost them. And think about how that works in our lives, where we meet somebody, and we label them. It’s very hard to shift that label, right? We see them through that filter down the road. So when you’re a speaker, I think that’s very important to craft the first 90 seconds, the first three or four minutes. Because when it’s set up correctly, it makes that rest of the speech so much better. So I think really knowing how to open your speech is key. And that’s to relate to your audience, to perhaps be a great storyteller. In other words, people like to know that they discovered it. They found the meaning. And stories allow you to find your own meaning throughout without having to have somebody talk “down to you” and tell you what you don’t know. But I’m just going to share a story. And you can take from that what you want. So stories are captivating. Stories reveal values. I always ask myself, if I’m going to make a point, what’s the story to make the point? What’s the science to make the point? And what’s the silliness that I’ll bring to it which really means, for me, how do I make that playful? Is there a joke I can make around that point? So I got one big idea. And I’m like, “What’s the story that emphasizes it? What’s the science that backs it up? What’s the silliness, is it humorous? And then the fourth one, or the last one, is the strategy. Because I’m always wondering, all right, now that I got this amazing story. And I’ve got the science that tells me why I should do this. And Jon made me laugh which kept me engaged. Now, what’s the strategy? What’s the step that I have to do in order to go achieve that? That, to me, is a great presentation. And that’s how financial advisors can really connect with crowds. The best speakers are the best storytellers. The problem that I’ve seen with financial advisors is they get up there and they start spewing a bunch of facts. And it’s like drinking from a firehouse, and most people walk away with most presentations feeling like, “I can’t remember half of what they said. I don’t even know what to do next.” And the confused mind says no. But if we can help people feel a certain way and we can give them a little science for the left-brained people in the room and then we can give them some steps, and tell them where to go to get it, now we’ve held their hand and move them along and it’s powerful. I don’t know, was that good? [0:39:13] Brad: You nailed multiple things there, buddy. I see a lot in financial services. We have the curse of knowledge. And when you’re in it, living it all day long, 401K, rollovers, rough contributions, all of this stuff. It’s every day talk to you, right? But it would be the same as if you went in and the heart surgeon started talking human anatomy to you. They’d completely go over your head. And what’s interesting, I love the framework, I love the story, science, silliness is cool too, going back to crowd engagement. But we train logical to emotional. So going back to you do need to, especially in financial services support the math and source the contents. Because most people prefer a financial plan that actually is real and legal and based on knowledge or science. But you nailed it where most people miss it is speaking of talking down to people when you just come from that angle of knowledge. People can’t relate to it. They don’t remember. You know, nobody remembers the charts or graphs. But what they do remember is let’s take this to real world. I remember little Mrs. Smith that came into my office. And you tell a real story, one of our advisors basically said one of our guys that trained a bunch of guys is anybody that struggles setting appointments in their public events, he asks them directly how many stories did you tell? And almost always it’s a zero or maybe one. And stories equals appointments in our business. So it’s awesome that you hit on that. Another way is people would say, “What do you do?” I say, “Let me share with you a story.” So in 2007, there’s a little girl named Sophie who I actually referenced her mom earlier today, who had a brain tumor. And her mom came to our charity said, “My daughter is a raving fan of Kelly Clarkson.” Now, we thought, “Wait a minute. At four, could you really be a raving fan at four?” So we were a little skeptical. But we learned very quickly that this girl was truly a raving fan. She knew every word to every Kelly Clarkson song. That’s all she listen to. And it was beautiful. It was a beautiful story. We went to work to create an event for Sophie. And we got her in the limousine, off to the show, Rainforest Cafe dinner just before she arrived. And then, it was at the show Kelly knows that Sophie’s going to be there. But Sophie doesn’t know that. So Kelly gives her a little shoutout from stage and recognizes her. She lights up. And she thinks the night’s awesome but it’s over. But what she doesn’t know is that our mutual friend, John Ruhlin sent a text message to a buddy – because Johnny is maybe one of the most connected people on the planet – sends a text message, gets us backstage to Kelly Clarkson, where another one of our buddies, Jon Berghoff is the one hosting the event with Sophie. So Jon’s there. Jon’s the one that took her backstage, Jon Berghoff. And little Sophie was sleeping in her mother’s arms, Loren. And Kelly walks into the room and surprises everybody like, “Hey, ya’ll!” And little Sophie just like wakes up, turns around, locks eyes with Kelly and has the most beautiful smile I’ve ever seen. And we have a picture of that moment, of them locking eyes. And why that picture is so important is because about a month after that picture was taken, Sophie died. And at four years old. And that rocked our world. That rocked everybody’s world. And to this day, ten years later, we are still very close with Loren, her mom. We still keep in touch. We still communicate. And we honor Sophie’s life continually. We celebrate her life. And we’ve become family as a result of this event. And I think that when I tell that story to somebody, people are moved. And that’s the difference of telling people what you do and explaining the story and why you do it. And if anybody listening needed an example of what that felt like, well, that’s it. It’s the difference. It’s just so much more compelling and captivating. [0:43:32] Brad: Yeah. Well, your first little statement about made me cry on camera, I can tell you that much. And the thing with story, I feel like I know that little girl. I feel like my six-year-old boy, my five-year-old boy, my one-year-old girl, immediately I put my children directly into that story. And that’s the power of story right there. [0:43:54] Brad: Where do we go from here? [0:43:57] Jon: I think that what I would challenge everybody to do is I would challenge everybody who’s listening to just sit with that for a moment, to feel that and to also just take a moment right now to feel like that’s a heavy story and to allow that to feel appreciation for the people in your life that you love, and also to feel appreciation for people that you don’t know that might be struggling that you don’t know what they’re struggling with. I always say, you’re driving on the road and somebody’s riding your bumper. And you’re like, “This a-hole’s on my bumper.” But you don’t know him. Maybe their kid just had a seizure and are rushing him to the hospital. You get to choose how you see life. And I say, “Just see the love, see the joy. There’s so much pain, what’s not right with the world.” And yes, we need to address it and yes, we can’t turn a blind eye. But if we can try to see some of the beauty and the love that we don’t miss this experience, and we can honor people and love people and cherish people. Like, in other words, if you’re fighting with somebody, that fight might have legitimacy of why you’re fighting. But sometimes, let’s just need to let it go. It’s just not worth it. I remember somebody telling me one time I was in a big fight with my wife, and they said, “Look, you can either be right or you can be in love. What do you want of it? It was just like, that’s so good. Do you want to be right or do you want to be in love? And I was like, “I want to be in love.” Sometimes, I want to be right. I really want to be right. And I will compromise love to be right. [0:45:23] Brad: Well, one of my favorite quotes, which it actually can be said either way, “A man convinced against his will is of the same opinion still.” That also goes for women as well. [0:45:34] Brad: It must have worked out. She brought you tea, man. [0:45:36] Jon: That’s right. Yeah. It’s working out great. [0:45:40] Brad: So as you were going through the framework as far as how to give a speech, a couple of things popped up. We always typically recommend to get an intro. So in that first 90 seconds, I just wanted to get your thoughts in a public event. Do you always need an intro? Was it sometimes cool to not get an intro? What framework do you recommend there? [0:45:40] Jon: I think it really depends on the event for sure. And I would highly recommend writing an introduction for somebody whenever possible because even people that know you or love you or care about you can butcher your introduction. And that setup is really important. What you’re telling them is super important prior to taking the stage. Now, some people argue that. They’ll say, “An intro should be, “Ladies and gentlemen, give it up for Brad.” And then your job is to sell the audience. But sometimes that person doesn’t understand that if they can create a little expectation and excitement or set the framework, it just saves you from having to get up there and saying, “This is why you should listen to me, everybody.” If somebody can do a good job of saying, “Here’s why this person’s qualified to talk. Here’s their experience. Here’s some of their results. Or, here’s why they’re trustworthy.” That endorsement, that’s like imagine just what it feels like when you’re at party and somebody walks up and says, “Oh, guys, you have to meet my friend, Brad.” And they just gave you a ten-second introduction that really makes a big difference at times of how that conversation can go. And the more times that we make that introduction relevant to the other person or the crowd, that’s important. So my introduction will actually change, Brad, based on who I’m talking to. Literally, 80% of the introduction is exactly the same. But I’ll always ask how can I relate what I do to the audience and how can one sentence be like, “This is why he’s here.” And so I try to change that one sentence. If I’m speaking to real estate agents, I might even add into the introduction when it says, “Hey, Jon has spoken around the world to groups and organizations.” I would just add in “to multiple real estate companies.” So they know this isn’t my first real estate gig. So that little tweak can make a big difference. A lot of times, the introductions are too long. We think we have to work too hard for their approval before we take the stage. The perfect introduction is really like it’s not as quick as, “Hey, Brad is a runner. He’s a father. And he runs a really successful business. Give it up for Brad.” And it’s also not your entire bio, every accomplishment you’ve ever had. He graduated with a 3.9 GPA. That’s just overkill. When they try to read the resume. You need something that just tells them enough about you to wet their whistle. And then mine is like I have to figure out how many words it is. And actually, I could give you, if you wanted a link to this in the show notes, my speaker introduction that I give to people that they read when I take the stage. [0:48:35] Brad: I love it, man. [0:48:36] Jon: And that’s it. And I just email it to them. And I’ll customize it when needed. But that’s it. So I think it’s critical. I was in an event just recently, no kidding, where somebody who knows me really well butchered my introduction because they actually was too casual. And they didn’t set up what I needed to be set up. And so I really had to work to communicate some of the ideas that are normally communicated in the introduction. [0:49:03] Brad: Yeah. It’s interesting. We coach a lot that it’s kind of like having a co-host on a radio show. If Jon, if you got on and you’re like, “I was College Speaker of the Year” two times. All of a sudden, everybody’s like, “Who’s this arrogant jerk at the front?” Right? Where if I’m a good radio co-host, I’m just bragging on you, I’m not the authority, celebrity, and really just building up. Hey, here’s why this guy’s important to listen to and knows his stuff. [0:49:29] Brad: That’s what we coach as well. So it’s good to hear that. So on the speaking front, do you have any common tricks with hecklers, or let’s say audience members that aren’t engaged that are like falling asleep drooling on themselves during your presentation? [0:49:43] Jon: Yeah, that’s good. I love this because everybody could probably relate. They could just taken the stage and spoken to different crowds. I think there’s so many things we could talk about with that. One would be this, it would be speak to the occupied seats or speak to those who are engaged. Too many times, somebody’s standing in front of the room and they see somebody like checked out or nodding off. And they get offended and they start getting in their own head. Am I not that good? Is it important to read the audience? Sure. Is it important to understand what’s happening around you? Yes. Is it important to not give your energy completely to the person who’s falling asleep in the front row? Absolutely. You’ve gotta speak to the people that are there and with you. So I think that’s a key to dealing with certain types of people that might be checking out because there’s always some in the crowd that are like, I would say, speak to the fence. And what I mean by that is that in the room, there’s people that no matter what you say or you’re going to be brilliant. Because they’re just awesome people who always get value from everybody, no matter what happens. They’re going to be like, that was awesome. It’s exactly what I needed to hear. You didn’t necessarily earn that. That’s just who they are, right? Then there’s the other type of people that like no matter what you say or who you are, they’re going to hate you for that because they’re just like, if you’re really successful, like, “He’s super successful and arrogant.” If you’re not successful like him, there’s no experience. And if you’re average. He’s just average. It doesn’t matter who you are, they’re just going to hate you. And then you have these people in the fence. And those are the ones who are trying to win over to your side. They’re just right there and that’s who I’m speaking to mostly, is the people on the fence. And I’m trying to recruit them to my team. And so I speak to the fence. So I think that’s a key. I also think that when it comes to like a heckler or something that’s not going well in your presentation, you need to what I call “capitalize on offers”. And what that means is everything that happens to you is a gift for you. So let me say that again. Everything that happens to you is a gift for you because it’s just an opportunity for either you to show how you handle your s-h-i-t in front of a group, because nothing’s better than when something happens that’s not supposed to happen and you handle it like a pro. That’s brilliant. That’s like just somebody’s testing you and you passing. So I love that. In fact, it’s an opportunity for me to demonstrate that I’m more than just a rehearsed speech to the crowd. So when something goes wrong, if the air conditioning breaks and you have to address that, I always say call attention to it. Don’t just let everybody sweat and not bring attention to it, but reframe it. I remember, as an example, I was in a speech one time and there was some event happening on another wall. And it was interrupting us occasionally. And I said to the group, I go, “Hey, guys, here’s a game: every time you hear that group make noise and it pulls your attention, let that be a reminder to be more present here. In other words, let this be a game of skillful attention.” So in life, you’re constantly pulled away. And how we do one thing is how we do anything as it’s been said by many famous people. So let’s just practice that, that something’s pulling at our attention, we come right back to the moment. So that knocking shouldn’t be a reason that you’re disengaged. It should be a reason that you are. See, that’s called “capitalizing on an offer.” And it means that an offer can be a heckler which you can address. It could be the temperature. An offer could be the day that it is. If it’s Valentine’s Day and you’re giving a speech, you’ve been offered a gift. Now, it doesn’t mean that you have to utilize the offer. It means that it’s there for you to do what you want with it. Improv people are really great with this. It’s an offer. In improvisation, you’re always going, “Whatever’s offered to me, I’m going to roll with. I can’t control what comes my way because it’s all being made up on the spot. It’s just like any speech. It’s all being co-created in the moment.” So I think the key, Brad, is to be the type of person that is constantly capitalizing on anything that comes your way, whether you consider it to be favorable or not, make it in your favor. [0:53:45] Brad: So speaking of capitalizing just on the moment. One of the things that’s incredible to me as I get to sit here on this podcast and just interview awesome people like yourself. And it’s funny, we meet someone like you, Jon, and how we met was through two other connections before, John Ruhlin that I met through Joey Coleman. And it’s just like this exponential happening that just snowballs, right? So I wanted to take some time here and you host a super successful podcast, The Front Row Factor. You get to interview some awesome, amazing people, and some things that all go to back are these little nuggets, these little pieces of wisdom you’ve already given out a handful right here that I’ve scribbled all over my page. But with your podcast, have there been any life lessons or just phrases that stuck, that you’re like, “Wow! That literally just changed my life right there in that interview”? [0:54:42] Jon: Yeah. We’ve had some incredible folks on that have shared. At the end of every interview, I’ve pages and pages of notes. And I was actually thinking recently about going back and listening, or maybe even to each episode, listening just so I could take notes on my own guest, one more time, going back through it because I already end up with that. But, wow, what would be some nuggets that people have shared, I’m just going through the list of all the different people that have been on the show. It’s so difficult to pull like one that stands out. You know, one is, I’ll tell you, one of my friends, his name is Simcha Gluck. He goes by Sim. And he lives in Israel and he is the Co-founder of a game called “FreshBiz”. And it is an incredibly innovative game played by people who – well, actually, let me tell you the outcome, the benefit. The benefit of the game is that you can train your brain to look for opportunities in life, and how to build bridges and to work together and to co-create. That’s the outcome of the game. And so, one of the things that he talks about is that we all have these action cards in life. He calls them “action cards”. And there are things that we can play in the game of life. Like we can pull out this action card and play it at any moment that we want to. One of the things that I’ve taken away from that show and Sim is looking at life like a game, where it’s not about one person beating the other one to the end. It’s about figuring out how I can rewrite the rules of the game so that we can all win. Because one of the things that happens when they play the game is that they give people a certain number of rules and then say, “play the game”. And one of the revelations at the end is they could have won the game faster if they would have worked together. And, see, that’s one of the revelations of this game is that it’s about getting the entire group to the end faster. And people have breakthroughs in the game. They’re like, “Oh. That’s the whole idea. If I just share with somebody and I give them my cards, they give me their cards and we all win faster.” And people have light bulbs going off like crazy, like, “Yes! If we all bring our best to the table and give to each other selflessly, we can all win the game faster.” It’s not a fixed pie concept that you get this and I get this. And if I get more, I win. It’s like we can all bake the pie bigger when we all work together. That, to me, was one of the most amazing concepts. So, I mean, you should go, like anybody listening, could go check out the game, by the way, FreshBiz is the game. That’s “B-I-Z”. Buy the game, play it with your teams, and it’s amazing or reach out to the guys. And they do group facilitations. But if you’re a financial advisor and you’re looking for innovative ways to maybe connect with or serve clients and build relationships, this game might be a really interesting one. [0:57:55] Brad: Very interesting. The book I’m reading right now, “Ego is the Enemy” by Ryan Holiday. [0:57:59] Brad: Literally just had a chapter on that talking about putting campuses up and helping other people pay them. [0:58:16] Jon: Yeah. And that’s the idea of the Front Row. It’s that people are challenge, like, “Oh come on. Being in the front row life, you’re still a spectator.” And I’m like, “I get it. We want to be on the field playing the game.” But I always say, “Look, when you go through your life, if you’ve ever witnessed a beautiful sunset, have you ever watched your kids play in awe? Have you ever supported somebody in achieving their dreams and goals? How important is that in life?” Isn’t life so much more exciting when we go through as a fan? I always say, you know, fans who give energy get a better show. You are a participant. You’re a fan that gives great energy. You’re going to get a better show, better gain, right? And so, be part of it in that way. A big question is not “how do you get more?”, but it’s “how do you help others get more?” And that’s exactly what you just said is that you’ll have everything you’d ever want if you help enough people get what they want. I mean, you help enough people financially succeed in life and you’ll, as a financial advisor, that’s the name of the game. That’s how you win. You just have to help enough other people win. That’s called being a “super fan”. That’s showing up for them in their front row. And the more people you show up for in their front row, the more people are going to attend your event. And they’re going to want to be your raving fan. That’s how you win. [0:59:22] Brad: That’s awesome, man. All right. Well, we just have a handful of minutes left here. So if you’re good to transition to some rapid fire questions, I’ll throw them at ya. All right. So this is going to be a fun one for you because you’ve been around a lot of success and helped create a lot of success. So when you hear the word “successful”, who’s the first person you think of, Jon, and why? [0:59:43] Jon: First person that comes to mind who’s successful, I’m going to say my Dad. When I think of success, I think of my Dad because he’s somebody that has operated with a high level of integrity throughout his life. And, to me, success is about honoring your values. And how successful you become in life is not a measure of how much money you have in the bank or how many friends you have. But how many days you could operate through by honoring what you know in your heart are your core values as a human being. So I think that my dad is somebody that I look at as wildly successful. Now, we’re very different. We don’t approach life in the same way. But that’s not the point of success. Success isn’t about that success leaves clues, and it’s like, right, but that may be clues for how to live a life with another person’s values. So I need to recognize what success means to me and do that. And my Dad has taught me that lesson, to recognize what’s within us and then chase that. [1:00:43] Brad: You obviously did a good job. You’re a testament to that, so that’s awesome. [1:00:46] Jon: Thanks, brother. Thank you. [1:00:47] Brad: That’s awesome to hear. What is the favorite book you’ve ever read and how did it impact your life? [1:00:52] Jon: All right. So this is a bit of a fun one. So my favorite book is “The Miracle Morning” by our buddy, Hal Elrod. And so, I say that for a number of reasons why it’s changed my life. Not only is the concept sound, and that’s evidence by the fact that he has thousands and thousands of people all around the world who will tell Hal that he changed their life, and his book is now published in 25 different countries or languages around the world. I mean, he’s got, I don’t know, hundred thousand people in his community that are actively engaged in this process. And you can go check it out, www.miraclemorning.com, I’m sure something like that is the website. But why that book also is one of my favorite that’s changed my life in many ways is because how it donates a percentage of all those book sales to Front Row Foundation. And he donates over $2,500 a month to our charity every month all year long to support putting people in the front row with their favorite events. And Hal and I often talk about how in order to live life in the front row, one of the first things you have to do is to create a Miracle Morning routine. And Hal talks about that we create a Miracle Morning routine so that we can often go out and live life in the front row and to serve, and to give to the world. And it’s been a beautiful partnership between Hal and I and the Front Row Foundation and the Miracle Morning community. And he’s our number one donor. He personally has donated more than any other even company or any grant or anything to the history of the Front Row Foundation. And we’re beyond grateful to Hal, not just because of the financial contributions though but because of what his book also gives to our recipients, that taking of ourselves, if you will, in the morning, so that we can go take care of others during the day is such a powerful concept. And so that book has transformed my world and many others. [1:02:41] Brad: Well, it’s transformed mine too. I met Hal out of your Dad’s Retreat. Stellar guy. And fighting an illness himself right now. I’m getting the sense that he’s got a lot of people in his corner like yourself and a lot of close friends. But, yeah, that book has me getting up at 4:45 AM every morning. I don’t know if I should tell him thanks or whatever. But it is so true. My buddy, Michael Hyatt, who’s a big goal setter. He talks about having push goals. You might have ten goals, but there’s one that really drives the other goals. And, to me, that’s morning routine. If the morning starts out right, it kind of bleeds in everything else you do. So I didn’t know that was your favorite book, but I definitely know why. [1:03:23] Jon: Yeah. And Hal is writing the foreword for The Front Row Factor book which is awesome. It’s just perfectly fitting, yeah. [1:03:30] Brad: We haven’t talked about it. When is the book live? When does it launch? When can everybody go get it? [1:03:43] Brad: Cool. We’ll put that in the show notes for everyone. [1:03:45] Jon: Yeah. Thanks, man. [1:03:46] Brad: All right. Two more questions. If you could look back, you said you did your timeline, Jon, when you were 40. How old are you now, if you don’t mind me asking? [1:03:55] Brad: 41. And how old were you when you started the Front Row Foundation? [1:04:00] Brad: 30. Let’s go back to 30-year-old Jon, just quitting his job and going out on a new adventure starting a foundation from scratch, and starting a speaking career from scratch. Looking back now with knowledge you have, what would you tell your 30-year-old self? What advice would you give yourself? [1:04:18] Jon: I think I would just say, you know, keep going. You’re on the right track. Follow your heart. Because I think that that’s just what you need to do is you need to keep making bold moves. And you need to keep showing up every day. So I would just encourage myself to do that. I think I would also encourage myself, like if I was to give myself advice, would be to not take some things so seriously. Like I remember there were moments when it mattered so much that because it mattered made me mad. And I think that mad can be fuel when used in certain ways. But I don’t think it has to be the fuel source we go to. We can find fuel in other ways. That’s just one of them. Mad creates energy. It’s like I’m so mad at this. I’m going to fix this. But we can also find fuel without having to tap into that source, that type of fuel. And I think I would just remind myself to just ease up a little bit because I think there were some moments, when especially Tatiana would tell you that I was so important and there was so much on the line that I was on edge. And I would lose my cool. And I would get angry. [1:05:56] Brad: Cool. Well, so, I always close my podcast with this, so we’ll have to make sure that this doesn’t overlap some of your other answers here. But if you had one piece of advice that you could share with the audience knowing that it’s a group of financial advisors that are primarily listening here that’s led to your success, what would that be? [1:06:15] Jon: That would be to define what I would call “who’s in your front row”. And, to me, that’s eight of the most important relationships of my life and to know who they are and what dreams they’re chasing. And just like our charity, we want to help people fulfill their dream and then live differently as a result of that. I want to do the same with the people I love the most is I want to know what dream makes them come alive right now and how can I play a role, an active role, in helping them to live out that dream. So my advice for people is to know who you want in your front row and then show up for them every day to help them fulfill the dreams that make them feel most alive. And I think that that is a life that when you get to the end, no matter what happens, that you will be very proud of. And whoever’s on that list, and that list might change, you might struggle with who should go on that list, you’re like, “Why did you make it only eight?” But you really have to narrow it down. It doesn’t mean I don’t show up for other people or love other people or care about people. But I need to know. Just like a concert, hey, there could be a thousand seats in that venue, but there’s only about eight front and center. Look at it that way. And if you’ve got a ticket for everybody in your life to show up to your event, who’s going to get the best seat in the house and know that and make that choice courageously, boldly, and then go and serve them. Give them a show of their life. Be their fan, if you will. However you want to twist the metaphor, just show up for those people. [1:07:47] Brad: Jon, awesome as always. I’m so grateful that you carved out some time here and for my listeners. I’m sitting here just scribbling notes. And I feel like I’m in the front row for this. [1:07:59] Brad: Thank you so much for carving out the time and joining us today. I appreciate it. [1:08:03] Jon: This is so cool. And, Brad, I want to say to you, man. Thanks for creating a world that’s ultimately my children will grow up in. I say this to all my friends and I think you know this that I really believe that you are shaping our community, our global community, in ways that my children will experience the benefits of your pure intentions and hard work. So thank you for that. That means a lot. I’m excited to build our friendship. I’m excited to hang with you at the Dad’s Retreat. I’m excited to keep supporting your biggest dreams and goals. So thanks, man, for having me on this. It’s a real privilege and honor. [1:08:34] Brad: Thanks, Jon. I’m humbled.